Toshiba has unveiled two new glasses-less 3D TVs at CEATEC in Japan, the first in the world to be available to the mass market. While they are not going to compete with the big screen 3D TVs out at the moment – the GL1 panels are a mere 12- and 20-inches - the technology does mean that that there may be a future for 3D in the home without using glasses. The new TVs work by using "nine different perspectives (parallaxes) of each single 2D frame which the viewer's brain superimposes to create a three-dimensional impression of the image." While parallax technology usually suffers from a narrow viewing area, Tosh believes it has fixed this, explaining is has "developed a powerful engine and an algorithm to extrapolate these perspectives out of the 2D frame and used a perpendicular lenticular sheet, an array of lenses, that enable the viewer's brain to superimpose the perspectives. "It also offers a wide viewing area in front of the display and allows movement of the eyes and head without disrupting the 3D image and without the discomfort sometimes associated with other 'glasses-less' 3D technologies." 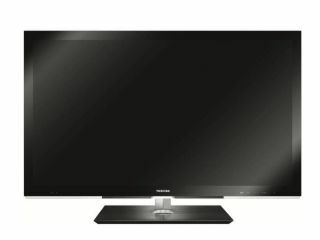 The products are to be released in Japan before Christmas and Toshiba is refreshingly not sounding the death knell on current 3D technology, noting: "it will take several years to develop larger 3D TVs without glasses with screen sizes of 40 inch and more at a yet reasonable price point. "Those who want to enjoy the 3D home cinema experience on a large screen already today are well served by 3D TV using active shutter glasses like the models of our WL768 series." There is no word on price, but Toshiba also revealed it is working on a glasses-less 3D laptop. It showed a prototype of the 3D laptop with a 12-inch screen at the show. TechRadar expects both products to be shown off in the west in January – at CES 2011 in Las Vegas.